Bigleaf’s Core POPs are built on our standard deployment model, with a large equipment footprint and the most diverse peering. These scaled-out POPs directly peer on the largest peering exchanges in each region, and have very large amounts of available network capacity. We deploy Core POPs where there are large numbers of customers, partners, and demand. Bigleaf’s Edge POPs are a nimble, fast way for us to get service into a new region. These POPs provide the same great services as our Core POPs, with a couple of minor differences. The first is that we currently cap our service packages at 500/500Mbps in Edge POP locations, and the second is that our Edge POPs don’t directly peer on the regional peering exchanges, but instead use a 3rd-party partner to connect between our servers and the peering exchanges. Edge POPs retain the diverse network connectivity, dedicated hardware, and independent network operating model that our Core POPs are built upon. Once Edge POPs reach a certain scale of customer traffic, we upgrade them to Core POPs to ensure plenty of service capacity in the region. We peer with over 150 different cloud, content, and carrier networks. 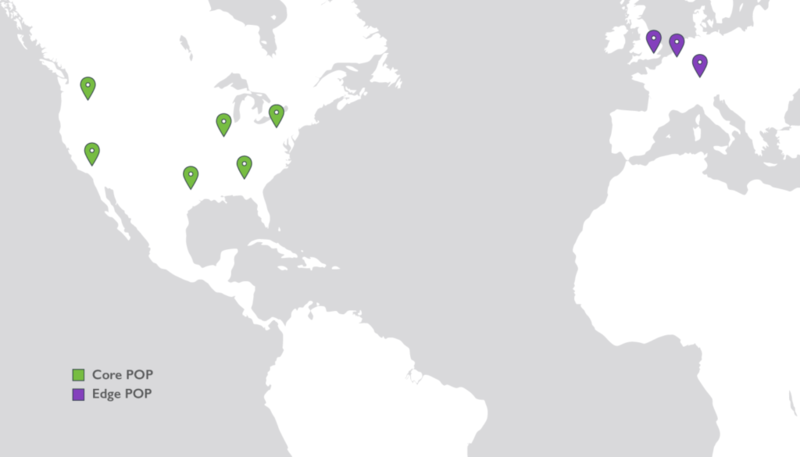 Each of our Core POPs connects to the major peering exchange in each region, and we select our POP datacenter locations because they have the best peering available. We carefully select carrier partners in each region where we establish network POPs, optimizing for the best performance. Those carrier partners include NTT, Telia, and CenturyLink. Looking for Bigleaf in your area? Using our Edge POP architecture, we can deploy quickly in new regions. If you’re a partner with customers who want Bigleaf, or you’re a customer with multiple locations in a new region for us, please reach out so we can chat.